mostra dell’artista fotografo Giuseppe Lo Schiavo intitolata “Génesis”. 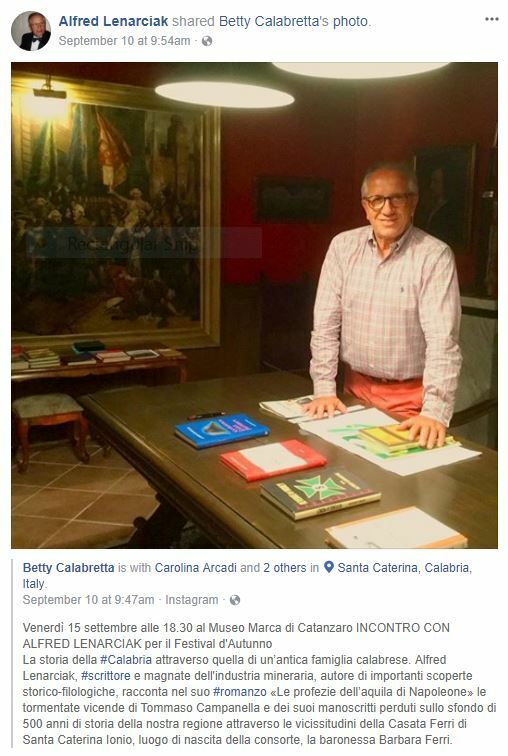 curata dal critico d’arte Roberto Sottile. Piraina, che fa parte del comitato scientifico del Marca. 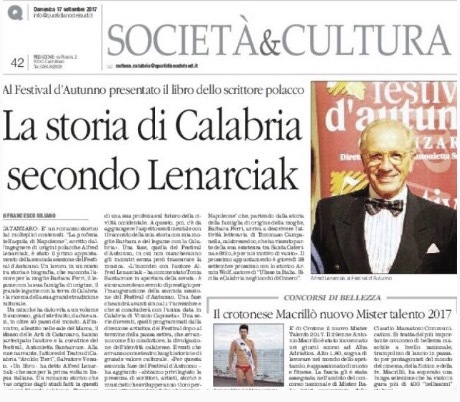 mondo, e lo scrittore, storico e magnate delle miniere Alfred Lenarciak. surreali presenze che accentuano la naturale bellezza del paesaggio. 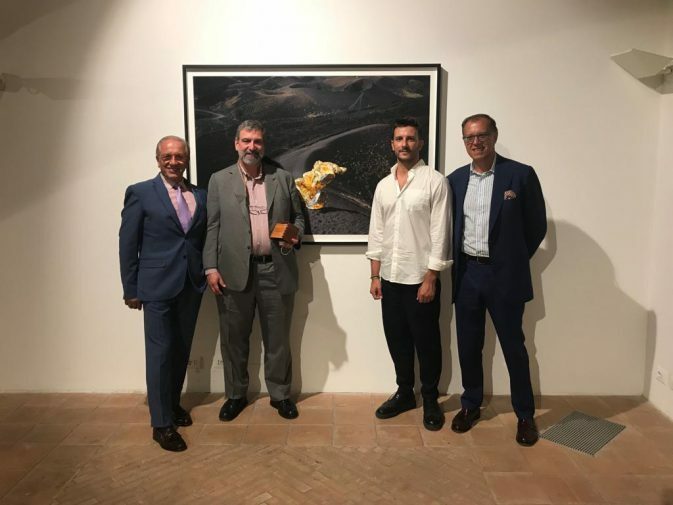 Having our friend, art critic, art historian, politician, cultural commentator and television personality Vittorio Sgarbi over to see the scena of Napoleon’s Eagle Prophecy! TORONTO, March 05, 2018 (GLOBE NEWSWIRE) — http://335th.com/collections/page/2?action=yith-woocompare-add-product http://thesunsetsblack.com/cms/ Aurania Resources Ltd. (TSXV:ARU) (“Aurania” or the “Company”) announces that it has created an Advisory Committee and is pleased that Mr. Alfred Lenarciak has joined the Company as an independent Special Advisor to the Board of Directors. The Company’s intention is to include Mr. Lenarciak on its slate of directors for the forthcoming Annual and General Meeting scheduled to be held on April 25, 2018. The Company also granted an aggregate of 250,000 stock options to Mr. Lenarciak and members of the management team. Mr. Lenarciak has over 25 years’ experience in the financing and strategic development of resource companies in North and South America, Africa, Europe and Asia. Mr. Lenarciak started his career as a civil and mining engineer in 1975. In 1983, he studied finance at the University of Quebec and worked in investment banking in the junior mining industry until 1990. He was then retained by the World Bank to oversee the privatization of the mining industry in Poland. 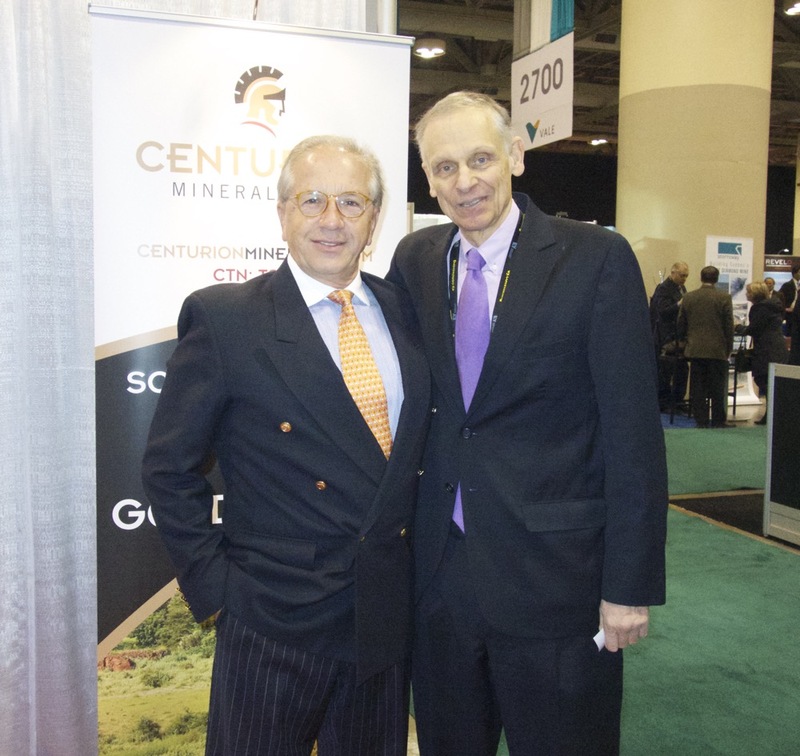 Between 1992 and 2014, Mr. Lenarciak served on the board of directors of more than a dozen TSX-listed companies including Williams Resources, Minorca Resources Inc, Dayton Mining, McWatters Mining Inc, Unigold Inc. and Centurion Minerals. 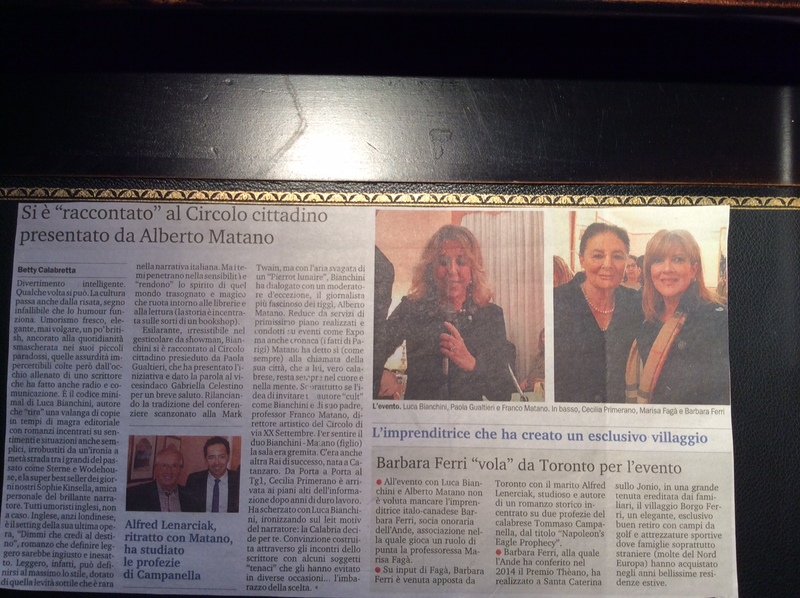 Lovely article by the supremely talented journalist and writer Betty Calabretta who attended. Sunday, September 17th 2017. 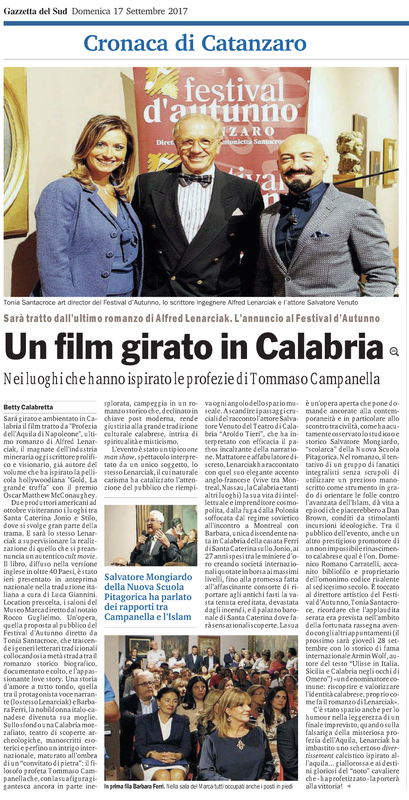 Coverage in the Culture & Events section of Corriere della Calabria on Saturday, September 16th 2017. 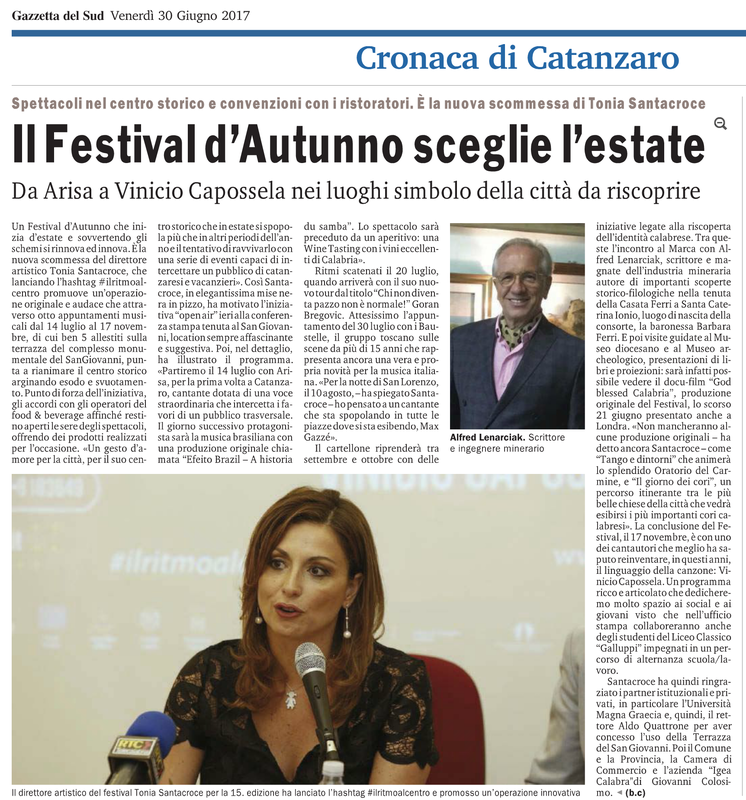 Coverage in the Society & Culture section of Il Quotidiano on Sunday, September 17th 2017. 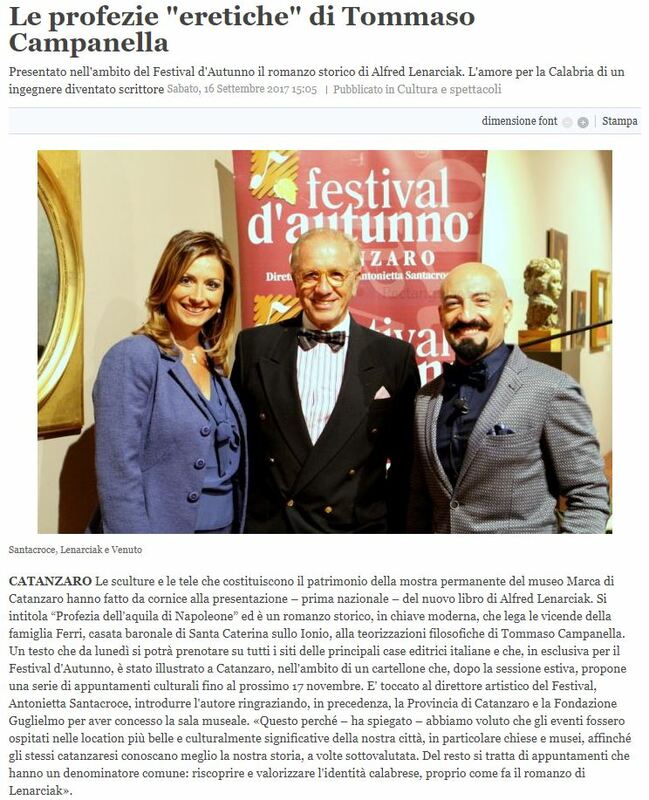 September 15th at the Marca Museum in Catanzaro presenting Le Profezie dell’ acquila di Napoleone! A legendary “suicide” after the Bre-X gold mine scandal gets a remarkable twist in this suspense tale. 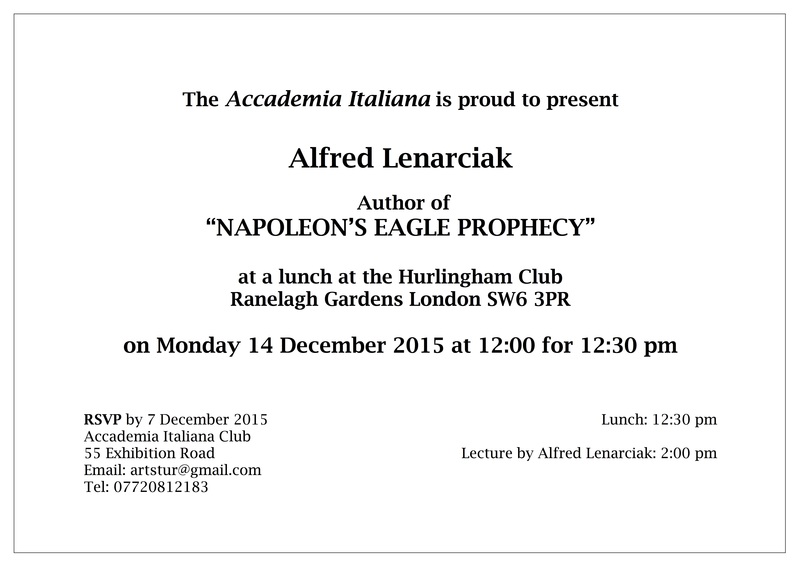 Lenarciak’s (Napoleon’s Eagle Prophecy, 2015, etc.) fifth novel is a variation on his fourth, which also explored the international intrigue surrounding Bre-X geologist Michael de Guzman and his supposed suicide. This one is told as a “dead man’s tale” or an entertaining tall tale—or a confession—over drinks between two men on the fringes of the company whose $6 billion gold fraud scandal rocked 1990s Canada. Bre-X Minerals Ltd. stock had risen astronomically on speculation of unparalleled amounts of gold being mined in Busang, Borneo, then crashed in 1997 when it was discovered that de Guzman had salted the core samples with gold panned from Borneo’s rivers. The novel’s protagonist (the author himself), a mining investor, meets, through Opus Dei in Rome, Akiro Guzzo, a mysterious businessman. 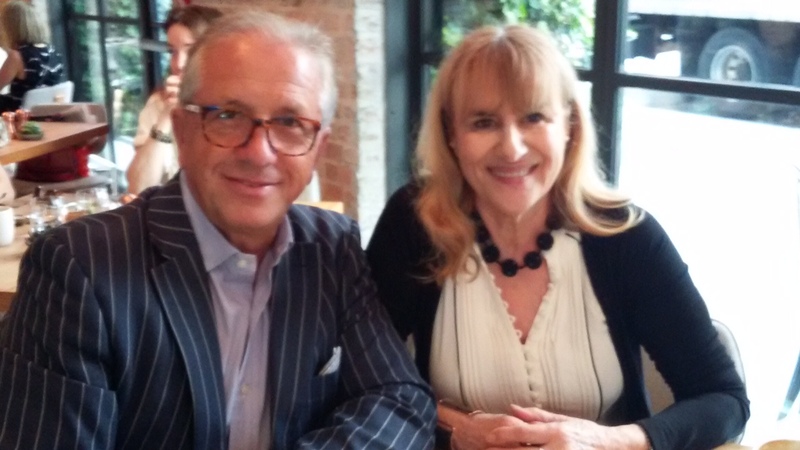 The two agree to have lunch in Rome to discuss business, yet as the date approaches, Lenarciak becomes suspicious, realizing that Guzzo’s life story doesn’t add up. When Lenarciak discovers a connection between Guzzo and the Bre-X scandal, the protagonist fears that his life may be in danger from the Mafia at the businessman’s behest, perhaps seeking revenge for fortunes lost. In disguise, Lenarciak hovers in search of enemies, then decides to keep the rendezvous in Rome and ends up hearing from Guzzo a story stranger and more convoluted than any article reported in the press or written by historians. But is it true? Or is de Guzman really dead? This odd, sophisticated mixture of true and revisionist history leaves the reader without any clear sympathies: no one is morally pure, especially not the Roman Catholic Church, yet womanizer de Guzman is as motivated by his desire to provide for his family as by greed. The expository dialogue plods at times but becomes intriguing when Guzzo reveals the interlacing relationships of the Indonesian government, off-shore accounts, illegitimate children, and local politics. The author unnecessarily repeats his back-cover synopsis several times—these references could be cut, as they may frustrate readers before the plot twists finally accumulate. A slow-moving, sometimes-clumsy thriller that gathers momentum to deliver a rewarding conspiracy theory. 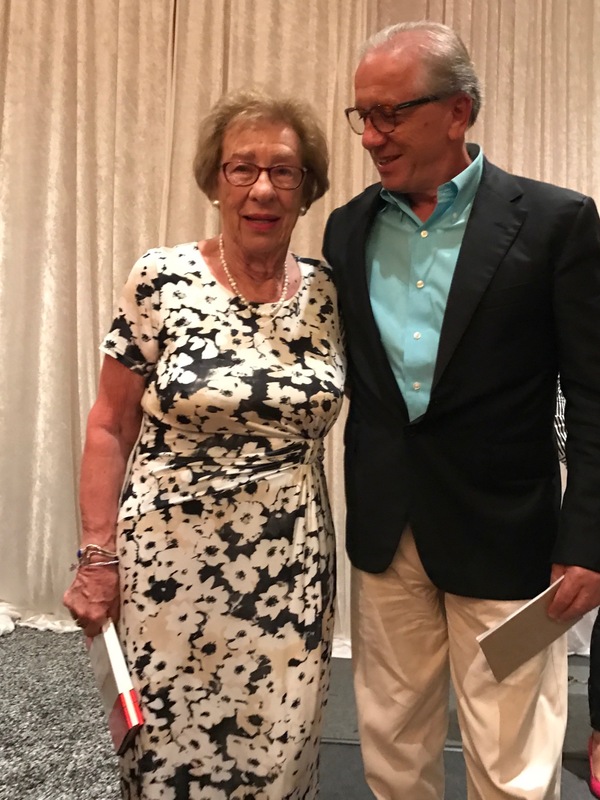 Nassau, NP – Had the great pleasure of meeting Eva Schloss — the Holocaust memoirist and step sister of Anne Frank. 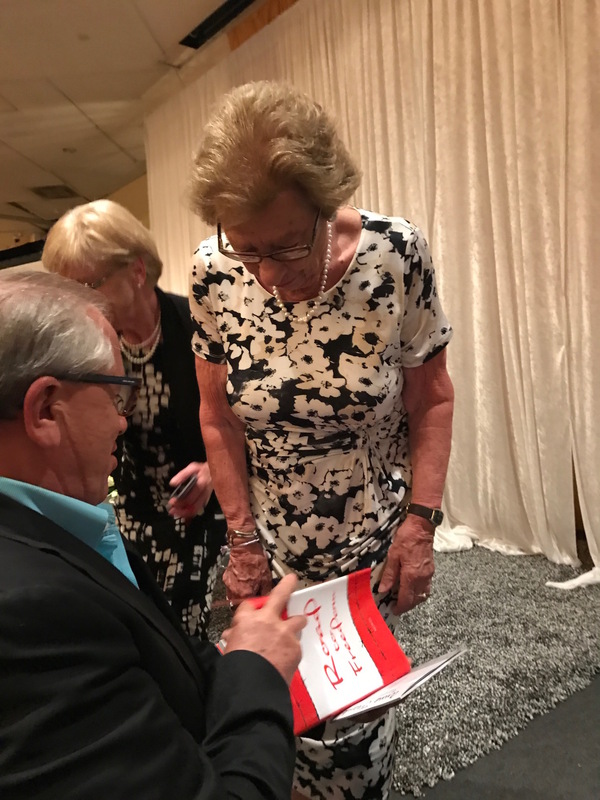 Fascinating discussing her inspiring books About Eva, and The Promise as well as presenting her with my book Road to Freedom. Toronto, ON – From author Alfred Lenarciak comes a gripping novel of conspiracy, deceit, and greed. “Gold of Bre-X” follows the Canadian company Bre-X Minerals and its rise and fall because of the “discovery” of an easily extractable gold found during their exploration for gold on the Busang property on the Indonesian island of Borneo. Bre-X’s efforts bore the discovery of a lifetime: a mammoth deposit estimated to contain over 200 million ounces of easily extractable gold. The company’s stock exploded from 25 cents to over $270, effectively valuing Bre-X at over $6 billion and attracting the interest of major mining companies. The world’s biggest gold mining companies started competing to develop the largest gold deposit ever discovered. Indonesian President Suharto and his government took control of the deposit by force and commissioned Freeport (American company) to build a mega mine. In the ensuing months, due diligence revealed that the deposit was a gigantic hoax. There was no gold in Busang. The principals of Bre-X were accused, but never convicted, of salting samples before sending them to labs. With everything that happened, what happens to Michael de Guzman, the man who “created” the fake gold for Bre-X? Alfred Lenarciak was born in Poland, and in 1975 emigrated to Canada. Degrees in engineering and finance were the platform that allowed him to invest in mining companies all over the world for more than 30 years. At the age of 60, he decided to become an author, writing novels inspired by his life experience. 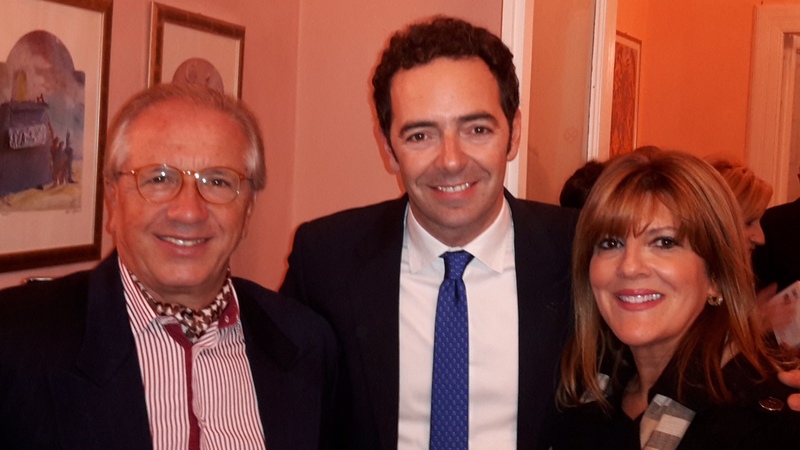 He lives in Borgo Ferri, Southern Italy, with his wife Barbara, as well as in Nassau and Montreal; devoting his life to writing, philanthropy, and traveling. In the last two years, he published five novels distributed in over 40 countries and is currently working on a new project. 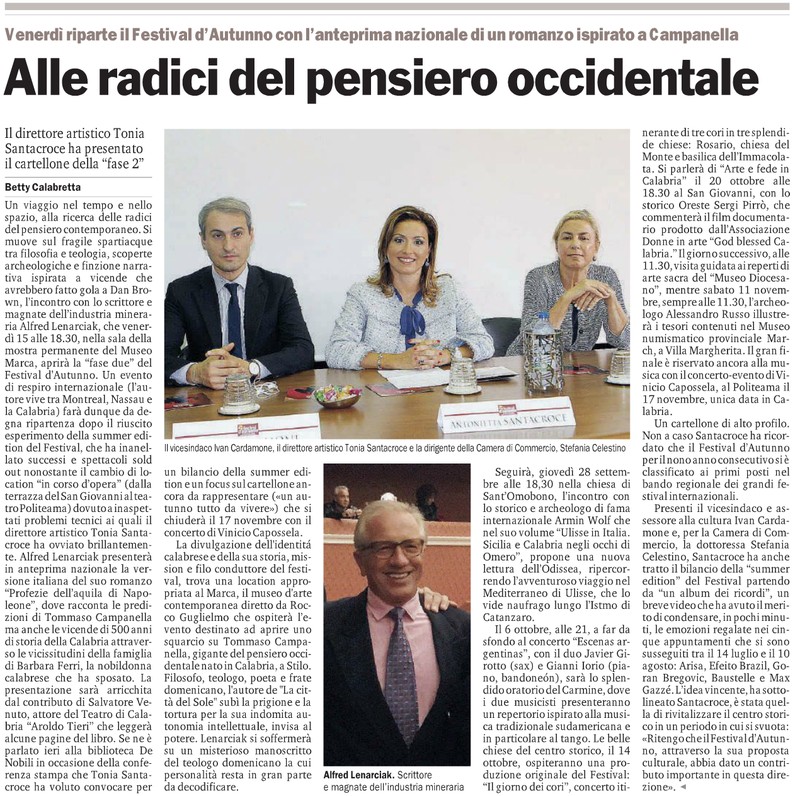 I am proud to be one of the founding members of the NEW PYTHAGOREAN SCHOOL of philosophy and science reborn in Crotone, Italy. Around 530 BC Pythagoras opened his first Academy in ancient Kroton, Magna Grecia (Today Crotone) unifying science and philosophy. Bre-X Dead Man’s Story, which is the definitive inside look into the biggest mining fraud in history. There is a movie in production based on these events entitled Gold with Matthew McConaughey for which Alfred received an option. Welcome Alfred! Published Four Books In Two Years! 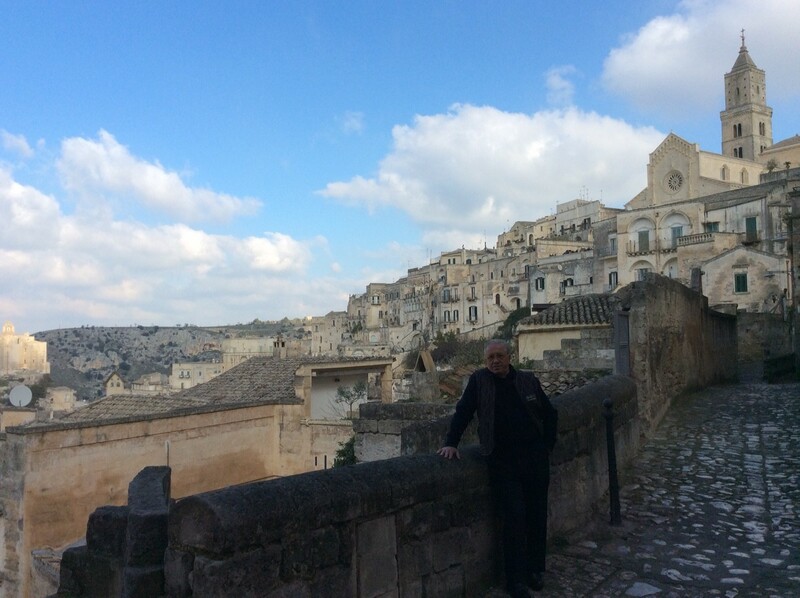 Presentation in Matera-Italy. UNESCO World Heritage Site. Upcoming European Capital of Culture. What would you do if your trip to a family home in a foreign land yielded the discovery of a lifetime? Alfred Lenarciak happens to be married into the old, noble Ferri family. So, he and his wife Barbara trekked to her maiden land in the south of Italy to work on reconstructing her family’s baronial palace. In the process they uncovered a hidden library containing the manuscripts of Tommaso Campanella, who was a leading philosopher and prophet during the Renaissance. 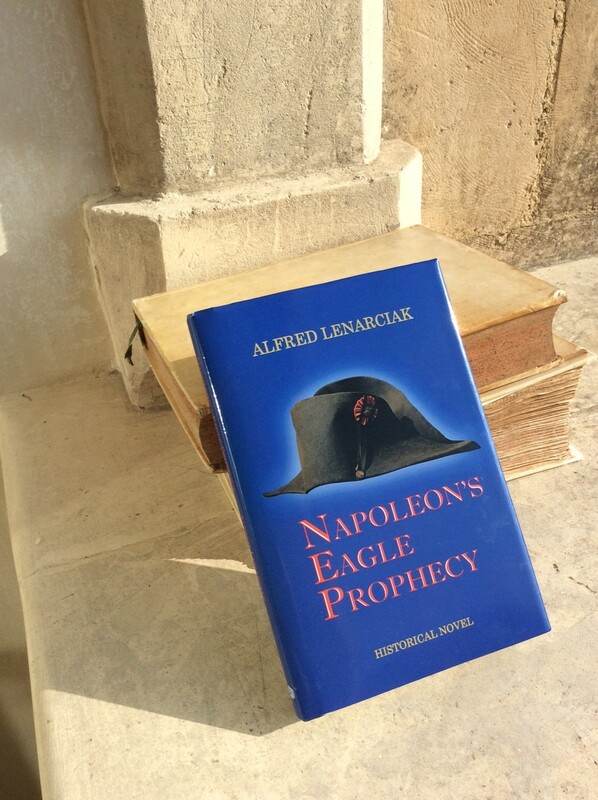 Campanella became famous for writing prophecies on behalf of various Popes, kings and even Napoleon. After making the discovery of the documents many experts were impressed by Lenarciak’s find, but certain extreme political and religious factions began clamoring for them believing the manuscripts could provide them with powerful propaganda knowledge. 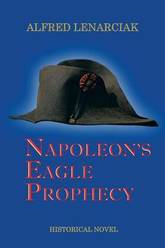 Lenarciak has turned his experience with the documents and the stories surrounding their past into his new historical novel, “Napoleon’s Eagle Prophecy.” Combining personal stories, historical facts and modern political insights the book contains a wealth of adventure and knowledge. 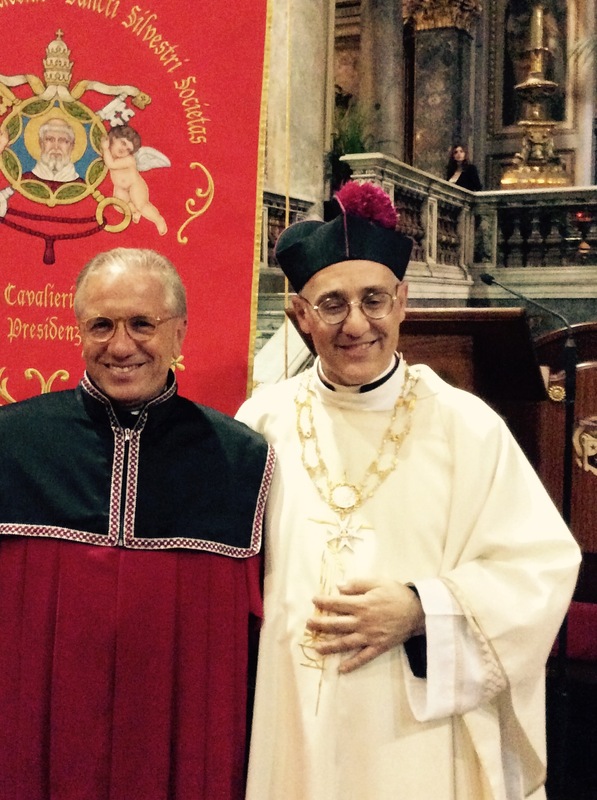 May 30th, 2015 At a splendid ceremony at the Basilica of San Silvestro in Capite in Rome, Alfred was made member Cavaliere of the Order of Pope Saint Silvester. On May 30th 2015, Alfred was elevated to Cavaliere (Knight) of the Order of Pope Saint Silvester, an Order of Merit to the Holy See. Road to Freedom was featured in a Spotlight of the June-July issue of BookMad Magazine. 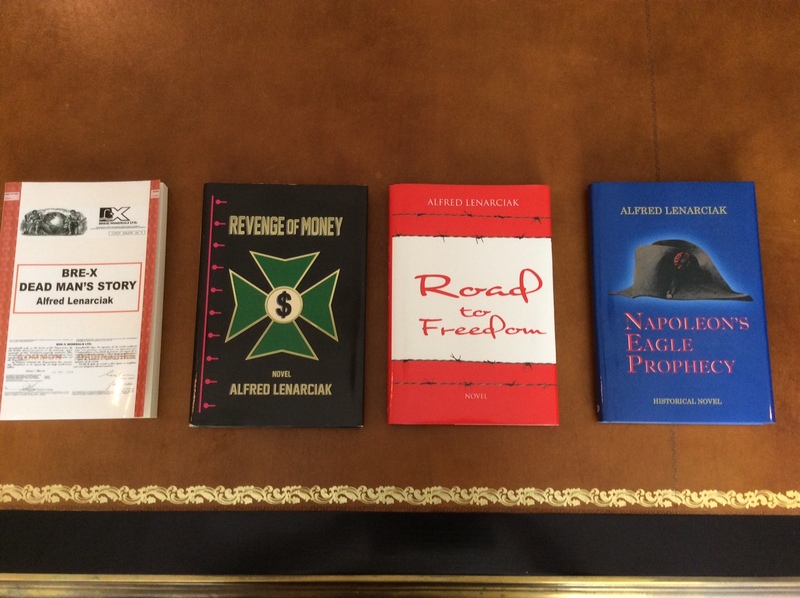 AuthorHouse is proud to welcome Alfred Lenarciak to our contributor community. 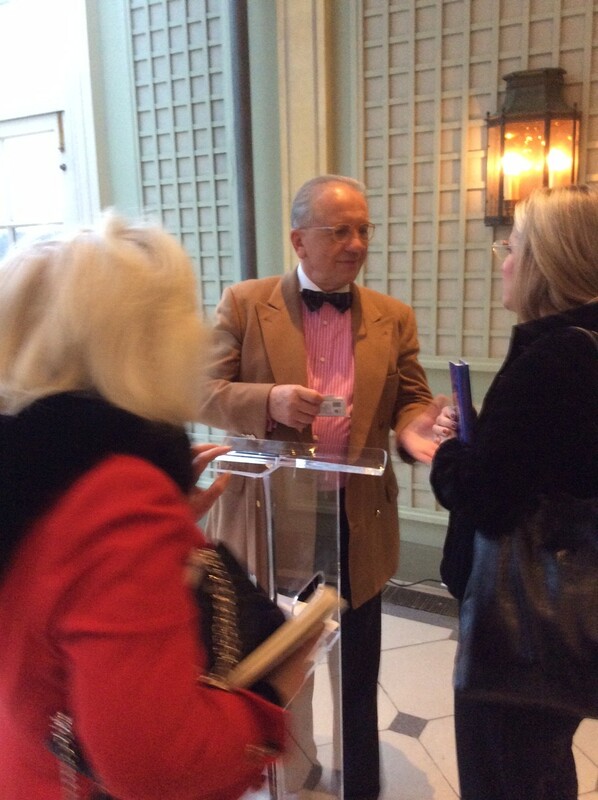 Born in Poland in 1950, Alfred escaped the Communist regime in 1974 and later immigrated from France to Canada. In addition to a background in engineering and finance, he is also the self-published author of three books–all released last year! 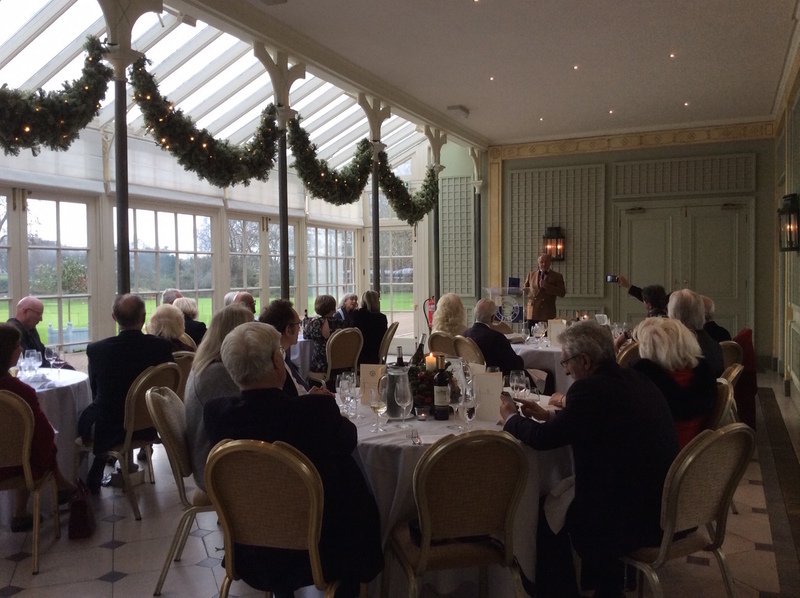 Alfred is obviously a very busy man, so we’re pleased that he could take a few minutes to talk with Author’s Digest about Road to Freedom, his latest book. Alfred, please tell us a little about yourself. I was born in Poland in 1950, escaped from the Communist regime in 1974, and later immigrated to Canada. Degrees in engineering and finance allowed me to invest and work in the gold mining industry all over the world, over a span of 30 years. 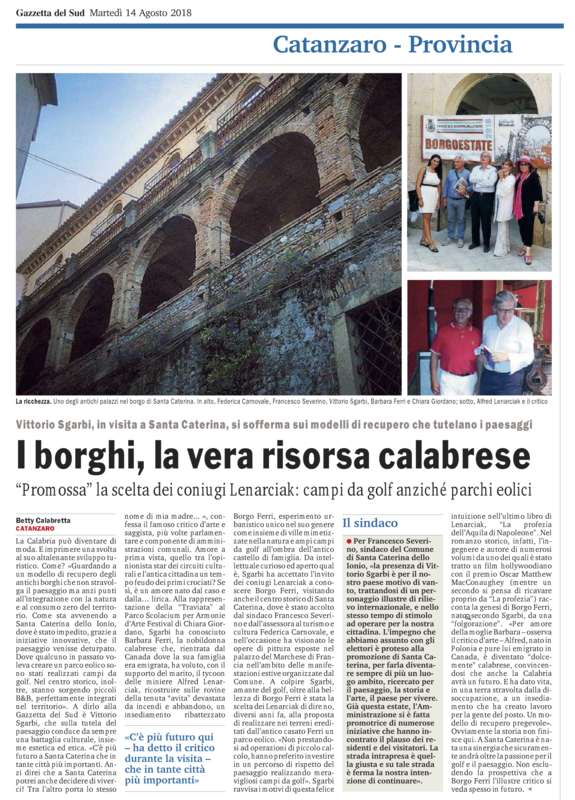 For the last decade I have been active in developing the ancestral estate of my wife, Barbara Ferri, in Southern Italy. 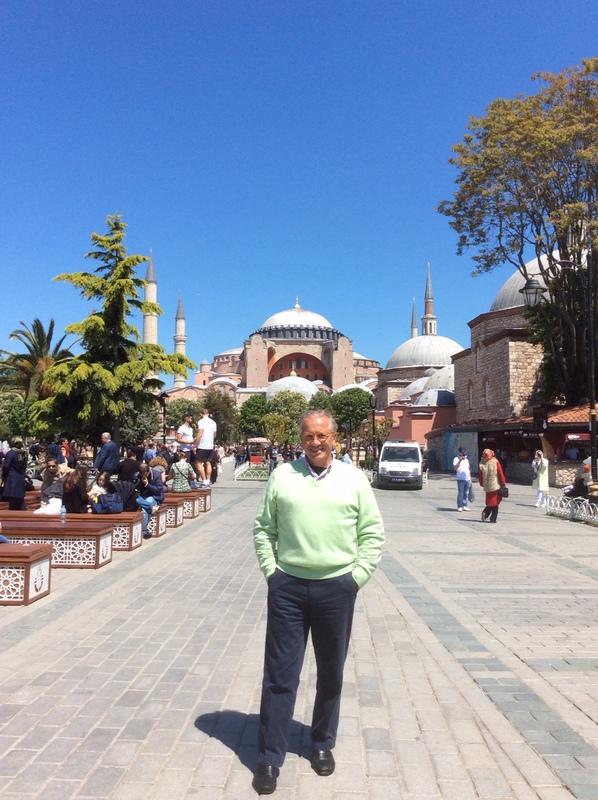 At the age of sixty, I decided to retire from active business and dedicate my time to publishing historical stories based on my life experiences, which I wrote over the last several years. I live with my wife in Nassau, Bahamas, while our son Max (with his wife Xenia) live in Toronto and work in an assets management firm. Do you have any literary influences that helped you develop your style? I love to read history, but my favorite author since I was young is Charles Dickens. Please tell us about Road to Freedom. My latest book, Road to Freedom, is based on my true-life story. This is a story of a 10-year-old boy who listened to a clandestine radio broadcast of President John F. Kennedy’s inauguration, discovered the significance of freedom, and decided to escape the Communist world to the free world. It took him 14 years of struggling and preparation. The unbelievable journey took him from Poland–through the Iron Curtain and risking his life–to Paris, where again he was hunted by French police and faced deportation back to Poland. Surviving almost a year under that oppression, he finally prevailed and found freedom in North America. We’ll present the conclusion of our interview with Alfred Lenarciak later this week. Until then, Alfred’s books are available in the AuthorHouse Bookstore (at the links above). There is nothing like a story being told by the person who experienced life as it was for those poor souls who were born under the rule of Communism. This story, as remembered by a young man whose very life hung by a thread, as he tried to escape to a land that meant “freedom” to him. This book details the dangers, abuse and prosecution of their own people by the Communist leaders of Russia, Poland, Czechoslovakia and Germany after the post-war days of the 1940s. This young man had a dream and that dream was to one day be free and through sheer determination and will power, he finally achieved that dream when he made his way to freedom and Canada. I found this story to be captivating and believable and so sad for all those left behind. Would I recommend this story to others? YES!!! Road To Freedom: From BehindThe Iron Curtain is the story of a young man (Albert) from Communist Poland preparing his escape to the free world. It takes him many years of struggling to prepare his plan. The story includes a hair-raising trip from Poland, through the Iron Curtain to Paris. When Albert is discovered without papers, he learns that escaping Communist oppression doesn’t mean he will be welcomed with open arms in the free world. Surviving for almost a year, hunted by the French police and facing deportation back to Poland, he finally prevails finding freedom in North America. In 1961 a 10-year-old boy, living in Poland, found himself glued to an underground radio as he hung on every word from John F. Kennedy’s inauguration. 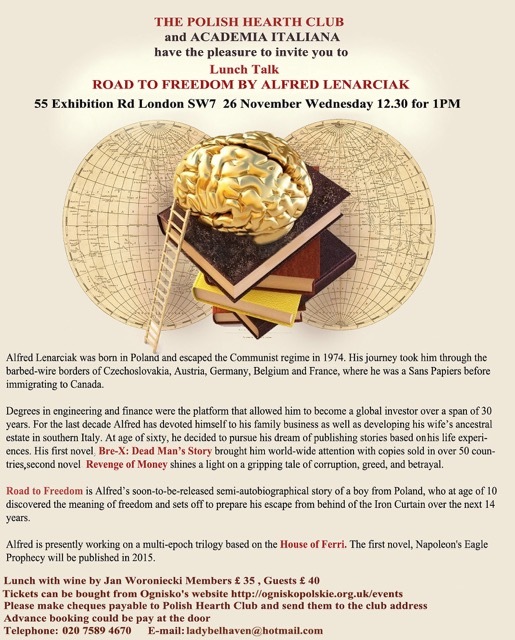 For author Alfred Lenarciak, this marked the moment he promised himself he would escape communism. In his new novel, “Road to Freedom,” Lenarciak details his 14 years of struggling and preparing to flee his communist home to the free world. Reflecting on his journey from Poland to Czechoslovakia, passing through the Iron Curtain and risking his life avoiding snipers by swimming the Danube River, Lenarciak displays the courage and determination needed to preserve the freedoms we enjoy today. “The Road to Freedom” will take readers to a time and place where life was without freedom. As audiences read the true story of a man who would stop at nothing to achieve free will, they will experience the drive it takes to claim liberty. The real-life scandal that helped shape modern gold mining and investment regulations for junior exploration companies has surfaced again. But this time, it comes to the fore in a new novel written by one of the peripheral players in the actual saga. 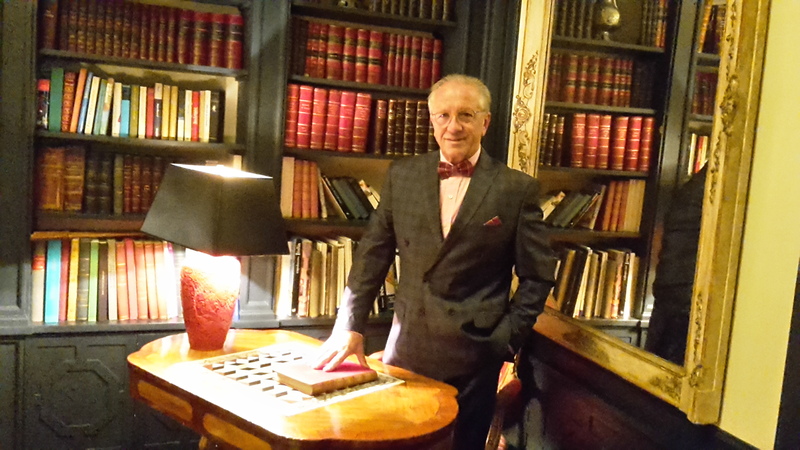 Alfred Lenarciak, chairman of Minorca Resources Inc., recently released “Bre-X: Dead Man’s Story,” a largely autobiographical tale based on many actual events in the biggest Canadian stock scandal in the country’s history. 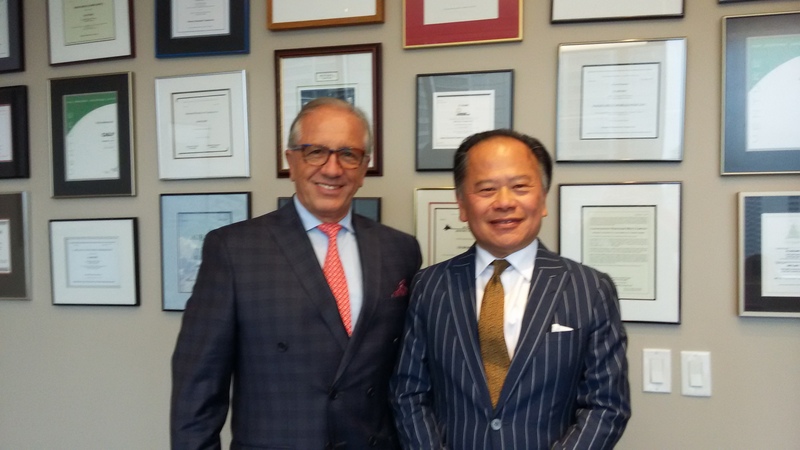 Lenarciak, a Poland-born emigrant to Montreal in 1975 when he was 25 years old and earned degrees in engineering and finance which enabled him to successfully invest in mining companies all over the world for a span of 30 years. In an entertaining 248 pages, Lenarciak reveals what went on behind the scenes of the buildup and fall of what was believed to be the biggest gold deposit on Earth, not only from his own perspective but also from that of a stranger that he claims to have met years later. This individual shared an incredible “inside” story of what went on in Indonesia during the years leading up to the Bre-X hoax. In an unpretentious first-person narrative, Lenarciak brings to life the world of high-risk investing in mineral exploration as it was in the late 1990s, while teasing readers with glimpses of the underlying greed and avarice that drives a significant amount of investment activity today. 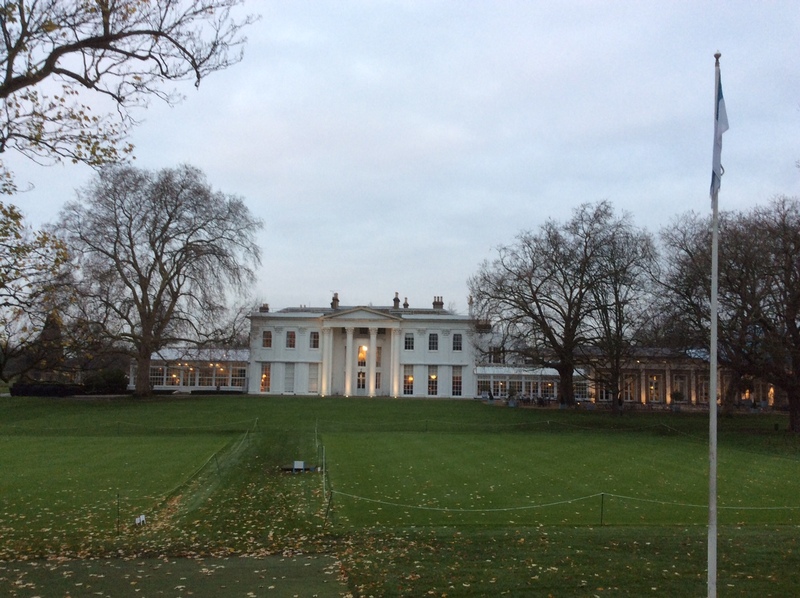 As one of the mining executives competing to develop the supposed gold mine discovered by Bre-X Minerals Ltd., Lenarciak is in a remarkable position to share an insider’s view of the events of 1996-97. Minorca had several properties in the Busang area with a total of 137,900 hectares (340,751 acres), including a small property adjacent to the much larger Bre-X holding. Lenarciak also gives readers a peek behind the curtain at the real world of junior mining – the competitive arena not even hinted at in most company press releases. From P.D.A.C. – the fabled global mining convention held every March in downtown Toronto – to the core shacks of a mine site in a remote tropical jungle, the book rings with an authenticity that defies its description as a novel at every turn. However, the book is devoid of many of the technical details that would give a clearer picture of how the mineral exploration fraud was perpetrated – facts and figures for which many readers might yearn. In an interview, Lenarciak told Mining News April 23 that he left out such facts intentionally. “All information about Busang are public domain, and I did not want to include too many technical details,” he explained. Instead, Lenarciak shares the color and pageantry in his memories of that time. On page 58, he writes: “Nothing in 1997 indicated that Bre-X would ever end. At their annual general meeting in Toronto, the huge room was full. I could not even get inside. David Walsh was speaking like a preacher. Though the book is no “Wolf of Wall Street” and offers no alleged master scammer like Bernie Madoff as the definitive culprit, it does without a lot of fanfare give readers an idea of what the world of big stakes investing is like. 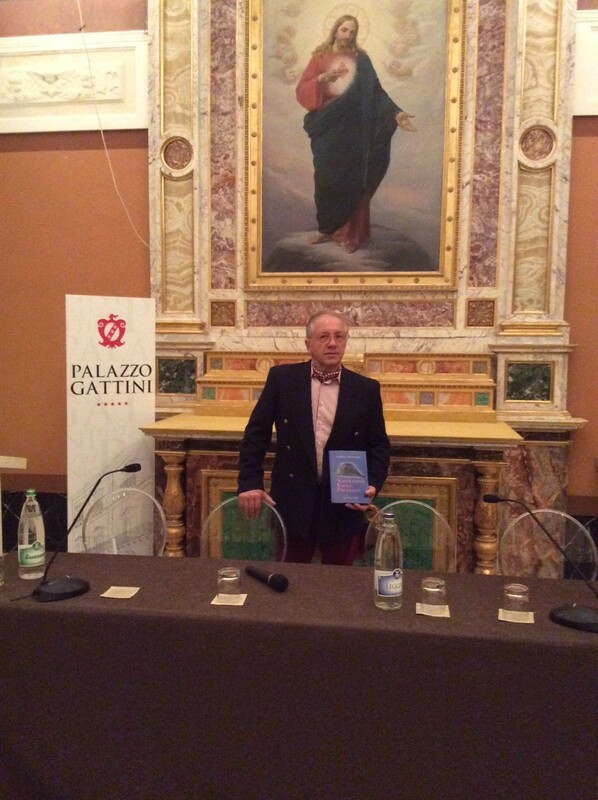 Best of all, the novel does a creditable job of explaining how a host of disparate factors came together in a way that allowed Bre-X’s management to fool everyone, from financial gurus on Bay Street in Toronto and Wall Street in New York to top Indonesian officials in the government offices of Jakarta. Lenarciak says the book is fiction, though he maintains that the tale is based on an account told to him by a mysterious man he met in Italy. “The intention of the book was not to make an investigative paper but rather a story which could be very probable and credible, written by an inventive mind with imagination galore,” he said. Why Italy? Lenarciak happens to live there, at least part-time, in a seaside castle that is his wife’s ancestral home. And not surprisingly, he uses the European country as a romantic backdrop for much of the story, including numerous travelogue-like passages in the book in which he describes the beauties and joys to found in exploring places like Rome, Naples and Lugano, Switizerland, half a world away from the jungles of Indonesia. It is in Italy that Lenarciak claims to have met the man who shared the incredible tale of how Michael de Guzman, the Filipino geologist believed to have masterminded the Bre-X hoax, did not jump to his death from a helicopter over the Borneo jungle. Rather, de Guzman managed to escape the promise of certain death in Indonesia and assumed a new persona to enjoy the good life in central Italy, according to this source. Lenarciak also devotes significant ink to the role that the Catholic Church played in determining de Guzman’s fate and cleverly links the church’s relationship with Filipinos and another major event of 1997– the out-migration of many Hong Kong residents to other countries before China’s takeover of the global city that year. The story at this point seems to morph into something of an action thriller, with liberal dollops of “Da Vinci Code” and “Bourne Identity-like” intrigue thrown in to spice the tale. In response to questions about the book, Lenarciak told Mining News that including the Opus Dei organization in the story was pure coincidence. “My personal involvement in Busang was real and described in the book, but Akiro Guzzo’s story can’t be verified; that’s why it is “fiction,” he added. “Bre-X – Dead Man’s Story,” by Alfred Lenarciak and published by AuthorHouse LLC, is available at Amazon, Barnes and Noble and Xlibris online bookstores. Joe Deaux – 04/07/2014 2:00 PM EDT Following the Bre-X gold deposit fraud of the mid 1990s, the project manager of the land, Michael de Guzman, disappeared. 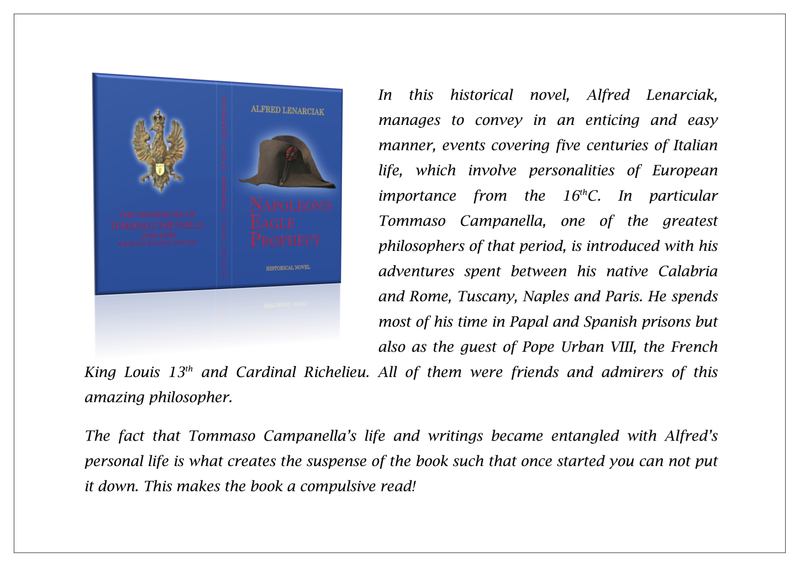 Author Alfred Lenarciak discusses his fictional book based on a real-life discussion in Italy with a man who described the life and “death” of de Guzman. When asked if the man who Lenarciak spoke to is de Guzman, the author tells TheStreet’s Joe Deaux that it could be, but he didn’t know for sure. As to whether de Guzman may still be somewhere, Lenarciak says it makes sense. You don’t have to be an industry insider to remember the story of Bre-X – the 200 million oz of gold in the jungles of Borneo that disappeared overnight. The story of the company’s rollercoaster ride – propelled by enormous greed – made headlines all over the world and severely damaging the reputation of Canada’s stock exchanges and mining community. The facts should be familiar. A junior explorer sets out in a remote part of Indonesia to make a gold mine. They drilled, and released promising results. Investors invested, driving up the Bre-X stock price, and the company suddenly had no shortage of investors. More drilling was done, and even better results were released. The analysts loved the project. Bre-X management made higher and higher contained gold estimates – 20 million, 30 million, 100 million, and finally 200 million oz of gold just waiting to make everyone rich. Of course, promises of huge riches attracts huge appetites. Bigger companies considered buying out Bre-X and gaining control of the Busang gold. The head of the Indonesian government, Suharto, wanted the pot of gold enough to usurp Bre-X’s claim to the property and asked an American miner to develop the project. Then it all went wrong. When Freeport began twinning Bre-X’s drill holes, their core was far from golden. The company declared the property worthless and went home, leaving Suharto, the investors and the analysts slack-jawed. Had the core samples been tampered with? Suspicion fell on Bre-X geologist Michael de Guzman who directed the drill program. The official story is that in March 1997 he jumped from a helicopter on his way back to the project. De Guzman’s body was recovered several days later. That put a satisfactory end to the Bre-X story; the one who salted the core samples with alluvial gold was dead and further investigation would not uncover a conspiracy to defraud investors. But what if de Guzman did not jump from the helicopter? What if he faked his own death and is living as a very wealthy man in Europe? That ending forms the basis of Bre-X – Dead Man’s Story by Alfred Lenarciak, who was chairman of Minorco in the 1990s as the Bre-X saga unfolded. Lenarciak’s company had a small share of the action at the Busang deposit, and he devotes the first four chapters to the facts. Then the author either began to write fiction or he did make the acquaintance of de Guzman’s son. He said the man was Michael’s illegitimate child who only re-entered the author’s life in the midst of the Bre-X fever. It was then, through a chance meeting in a Roman church, Lenarciak says he came face to face with de Guzman, albeit with a surgically altered face and a new name: Akiro Guzzo. The story of Michael de Guzman unfolds as Lenarciak and Guzzo sit over wine one evening. De Guzman’s tampering with the samples was an act of desperation, but once he started he couldn’t stop. The Busang project was too famous to fail. It’s not surprising he wanted to cash in on the wealth his options and shares were generating. However, if the reader believes de Guzman had the help of his private Swiss banker and the Catholic Church’s secretive Opus Dei order, the story is plausible. The author certainly presents it as such. The story of de Guzman’s purported survival is a quick, entertaining read. I recommend it even if the author’s style is never going to win a Pulitzer Prize. Let the reader decide how much to believe or not to believe. Enjoy. Bre-X – Dead Man’s Story, by Alfred Lenarciak, 248 pp in paperback, is available through Amazon, Barnes and Noble, and Xlibris online services. Veteran mining executive turned author Alfred Lenarciak joins Stu Taylor on the Stu Taylor show to talk about his new book, Bre-x: Dead Man’s Story. In the early 1990s, Bre-x was a small mining company based out of Calgary, Canada. They received global attention after striking gold in Busang, Indonesia. The sheer amount of gold the mine would hold was staggering; estimates reported that it would be the largest gold deposit in the world, perhaps larger than all of the gold deposits in the United States combined. Analysts, miners, and investors alike wanted a piece of this very large pie; Lenarciak’s own company at the time made a contract for a percentage of profits. Bre-x’s stock prices rose from a low of $0.25 to over $270 at one point. Indonesian President Suharto also wanted to profit from the Busang gold mine, taking over 45% of it by force. Though Bre-x’s investors were livid, Freeport-McMoRan Copper and Gold was hired to build a larger mine on their remaining portion of their land. It was during the initial stages of creating this mine that Freeport discovered the land held no gold. The discovery had an immediate effect on the market, which had been trading approximately one million shares of Bre-x stock at $100 a share. 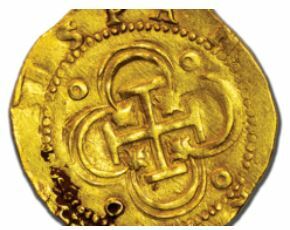 It came out that Bre-x had been fraudulently “salting” gold samples—adding gold to land samples being evaluated by labs. Nobody had questioned the truth behind Bre-X’s claims while the money was coming in. “In those days, euphoria was the name of the game,” comments Lenarciak. Since that time, more regulation and reporting standards have been added to the mining industry. Bre-x: Dead Man’s Story fictionalizes the story of Bre-x, taking the point of view of deceased Bre-x geologist Michael de Guzman, who was ultimately blamed for the company’s fraud. Lenarciak’s book is available on Amazon.com, BarnesandNoble.com, and Authorhouse.com. Listen to Alfred Lenarciak’s full interview on the Stu Taylor Show with Stu Taylor here. White-collar criminals could spend their entire lives trying to plan and pull off the perfect scam. What if I told you there is a man who did just that and lived to tell his story? The Bre-X gold mining scandal was one of the biggest media hits of 1997 and quite possibly the biggest Canadian stock scandal in the country’s history. 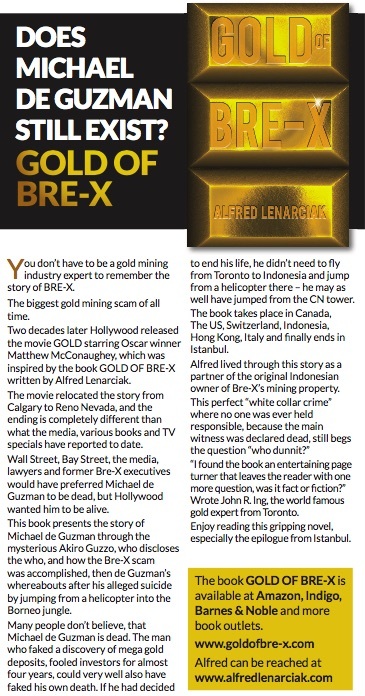 Alfred Lenarciak, author and former executive in the gold mining industry, just released his new book, “Bre-X: Dead Man’s Story?” He reveals what went on behind the scenes of the build up and fall of the biggest gold deposit on Earth, but not just from his own perspective. Lenarciak not only had a firsthand account of the story as an executive competing to develop the supposed gold mine; he spoke to someone who claims to have personally known the brains behind the entire scam, Filipino geologist, Michael de Guzman. Not intrigued yet? Michael de Guzman infamously jumped from a helicopter to his apparent death in an Indonesian jungle before the gold mine was pronounced a fake. 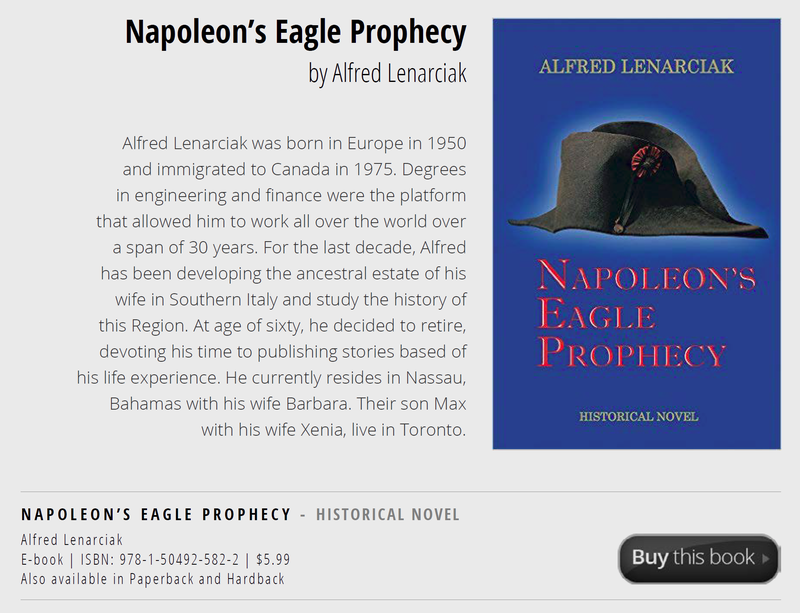 John Ing, president and CEO of Maison Placements Canada Inc., said, “I found the book an entertaining page-turner that leaves the reader with one more question, was it fact or fiction?” To this day, Lenarciak will play coy if you ask him if he really met with de Guzman, but that is what gives the novel its intrigue. The readers can decide for themselves. “Bre-X: Dead Man’s Story?” By: Alfred Lenarciak ISBN: 978-1-4918-4788-6 Available on Amazon, Barnes and Noble and Xlibris online bookstores About the Author Poland-born Alfred Lenarciak immigrated to Montreal, Canada in 1975. Degrees in engineering and finance were the platform that allowed him to invest in mining companies all over the world over a span of 30 years. 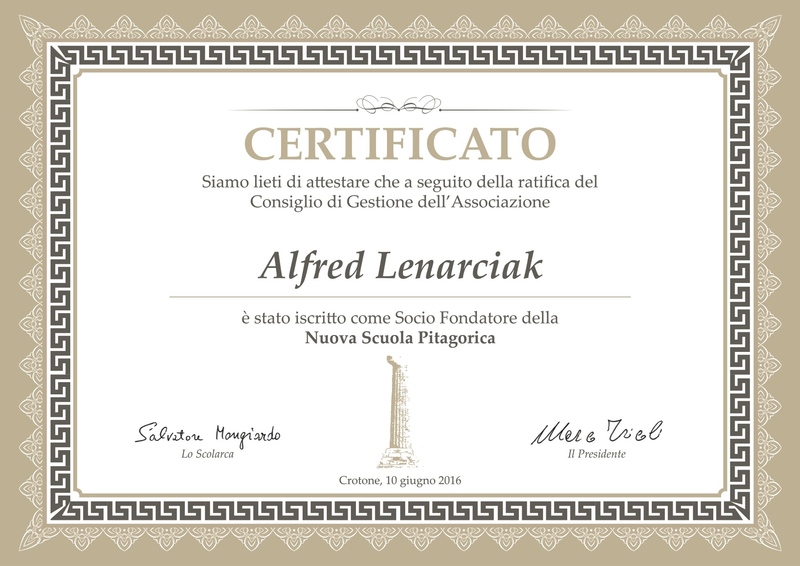 Lenarciak now spends his time investing, developing, writing and philanthropy. He currently resides in Nassau, Bahamas.